Like syrups, infusions can be made with almost anything. From bacon to tobacco to dried apricots to cotton candy. The sky is the limit. Generally speaking, infusions are another method with which to impart unique flavour into a cocktail. All you need is the flavouring, the base of choice and a mason jar. Some infusions require hours, some days and some weeks. It is important to do some research as to where your infusion falls. A general rule is that fresh foods should be infused for only hours, whereas dried foods require more time. Seeds, nuts and very tough items can be left for weeks. 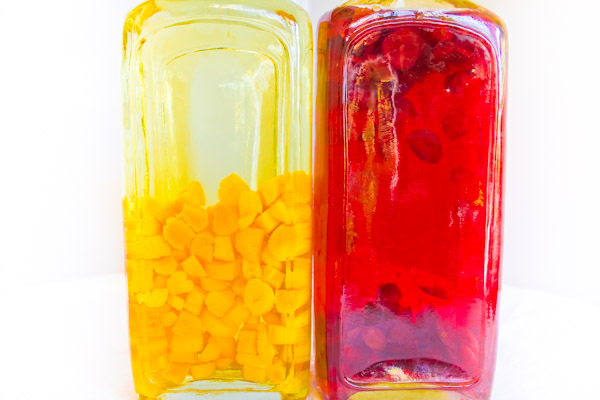 Infusions should be mixed daily and kept in the refrigerator when ready. As an amateur, infuse smaller quantities than the bartender books call for.